Gunung Datuk is located in Kumpung Batang Nyamor, Gadung, about 21km from Rembau Town and 15km from Tampin Town, in the state of Negri Sembilan. The summit of the mountain consist of huge rocks and was once used by Dato Perpateh Nan Sebatang to gather Ketua-ketua Adat (Customs Leaders) to announce the future Dao Lembaga (clan chief) in 1372. Now a days, this mountain is frequent by locals who camp near the summit of the mountain.There are no buses that go to the base of the mountain thus visitors have to arrange their own private transport. At the foot of the mountain, there are toilet facilities and one or two stalls during weekends. You would also have to register at the foothill and pay Rm1 for trek permit. According to another website, campers have to per Rm3 per tent for overnight stay on the mountain. The starting point of the trek is a flight of stairs that goes down to a stream. There is a small dam across the stream which you can walk across without getting wet. The terrain for the next 10mins is relatively gentle undulations. However, next come the most taxing part of the journey. For the next half an hour, it would be a steep ascent. Along the way, you will get to see big rocks that are common on this mountain. After passing the strenuous portion of the trek, the subsequent half an hour would be relatively easy with gentle upslope. A clearing with a hut means that the summit is near, on the left side. This clearing can be used as a campsite and it can hold about 4 tents comfortably. There are two rock walls to clear before reaching the top of Gunung Datuk. For the first rock wall, there is a rusty ladder which you use to reach the next level. A 2-storeys high rock wall is the final obstacle before the summit. Rusty ladders with careful footwork and handheld is required to reach the summit. As the summit is really on top of a huge rock, there are no large trees or thick vegetations to obstruct the view. However, this means that it is easy to get sunburn under such expose condition. The breeze and the scenery make the summit an ideal place for a picnic. 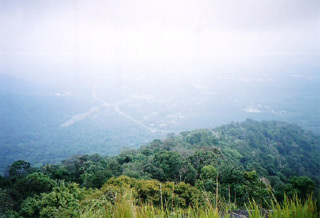 It is also said that the Straits of Malacca can be seen on a clear day. For mountains in Peninsula Malaysia that is under a thousand meters, Gunung Datuk provides one of the best treks. 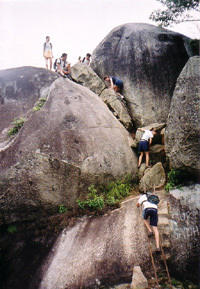 The terrain is varied with some obstacle challenges near the summit and there are no leeches to bother the trekkers. The view from the summit is unobstructed and currently, the mountain is still clean. However, one down side of this trek is that if there are many people on the mountain, the obstacle section will be a major bottleneck. There are virtually no other ways of getting round the obstacle unless you bring your own ropes and prepared to do some vertical climbing. Nevertheless, this is a worthy mountain or rather, hill, to visit. 1. Take North South Highway (either from 2nd link or Causeway) in the direction of Seremban and KL.2. Drive all the way. You will pass exits for Muar, Ayer Hitam, Yong Peng, Muar, Segamat and Ayer Keroh. Your desired exit is the Tampin Exit. 3. At the Tampin exit, after exiting the toll booth and making your (presumably) second contribution to Malaysian GDP, you should reach a roundabout. The 9 o’clock junction should be toward A’Famosa/Malacca/Ayer Keroh. I can’t remember precisely. Do not take this exit. Take the 3 o’clock junction. This should be toward Tampin. 4. After about 10 or 15 min, you will reach a T-Junction. You have now arrived at the old Trunk Road from Johore to KL, aka Highway 1. Take the left turn. This is toward Seremban/Senawang/Rembau. Do not take the right turn, which is toward Tampin. You’re now heading approximately northwards. 5. Travelling on highway 1 toward Rembau, within 10 or 15 min, or even earlier, you will reach a T-Junction without traffic lights. There will be a sign indicating that this is the turning for Gunung Datuk. Take this right turning off the highway. Should you overshoot, you will also see this sign going southwards after u’ve turned back. This T-junction is crucial. You must not reach any small towns or villages. If you do, you’ll definitely have overshot. I believe the first village you hit if you overshoot should be Pedas. Look out for a sign mentioning Gunung Datuk. 6. Okay, this part is a bit more difficult. After taking this right turn, you’ll find yourself on a small country road. You should pass a muslim cemetery on your left. (if I recall correct). By this time you would have seen a mountain range to your front and left. Datuk is part of this range. After about 15-20 min you will see another sign (again saying gunung datuk) directing you left into a rubber estate. This small turn-off used to be opposite a small bus stop. This sign is crucial if you’ve no-one with you who’s been there before. 7. You’re now on a small rubber plantation road. If u meet a car, either will have to pull to the side to make way. The plantation should remind you of the blair witch project! Hahaha. After about 10-15 min you’ll reach the Base of Gunung Datuk. This will be preceeded by a small clearing which is kind of a broad clearing in the forests running in a long line. Immediately after the clearing is a rather steep incline which will flatten out into a parking area. Parking area has a stone and signboard in the centre. 8. You have reached the foot of Gunung Datuk. Sign in at ranger station and have fun. Enjoy the view from the top! Hey, this needs some updates. The ladders are greatly improved and really safe and stable now.